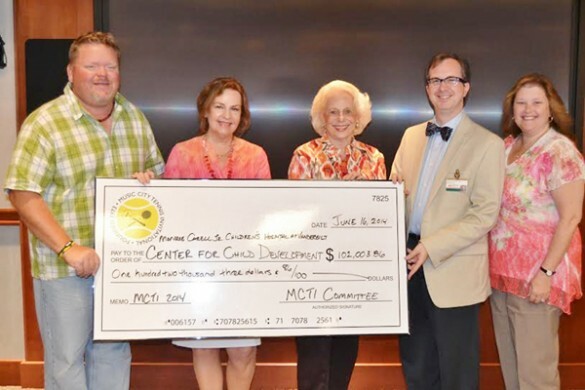 The 41st Annual Music City Tennis Invitational 2014 (MCTI) recently presented $102,000 to the Center for Child Development at the Monroe Carell Jr. Children’s Hospital at Vanderbilt. Founded in 1973 by Nashville music industry leaders, MCTI is the longest running music-related charity tennis tournament in the country, and has raised more than $1.5 million in proceeds from tournament player registrations, corporate sponsors, donors and songwriter showcases benefiting Children’s Hospital. From left are: MCTI co-chair Bill Riddle; MCTI sponsor chair Patsy Wells; MCTI co-chair Patsy Bradley; director of the Vanderbilt Center for Child Development Tyler Reimschisel, M.D. ; and Luann Mayer, assistant director of Community Development for Children’s Hospital.